Amid the sluggish recovery following the Great Recession, much attention has been given to the slowdown in productivity growth across advanced economies (sometimes referred to as ‘secular stagnation’; see Teulings and Baldwin 2014). In fact, the slowdown predates the Great Recession. In Figure 1, which plots the total factor productivity (TFP) of the US, a slowdown is already apparent starting in the mid-2000s. For some this may be puzzling, since the common belief is that automation and the increased use of computers should have raised productivity. Source: National Income and Product Accounts (NIPA) from the Bureau of Economic Analysis (BEA). The prolonged slowdown is of great concern to these economies, as it is not unrelated to many of the other pressing issues they face such as high unemployment and stagnating median wages. Sluggish productivity growth hampers the creation of jobs and may at least temporarily favour the rich, who benefit from rising rents on land and capital (Piketty 2014). In a recent paper in a special issue of the Journal of Monetary Economics, we investigate whether and how automation and the increased use of computers affected productivity trends in the last three decades (Aum et al. 2018). Our findings suggest that automation was in fact a strong force for slowing down aggregate TFP growth, despite raising productivity at the micro-level. This is due to the reallocation of factor inputs across occupations and industries – when certain occupations and industries experience above-average productivity growth, productive resources reallocate toward those with lower productivity growth if they are complementary in production. As this happens, high-growth occupations and industries lose relative importance and contribute less and less to aggregate productivity growth, resulting in its slowdown. The natural question, then, is why the productivity growth slowdown did not materialise until the mid-2000s. Indeed, the US had already undergone a phase of a productivity slowdown from the late 1960s to the early 1980s, following a wave of new technologies decades before the IT revolution (Figure 1). But from the mid-1980s to the early 2000s, this force was countervailed and temporarily dominated by the advent of the then-new computer industry, which saw an explosion in its productivity growth and of which output became an increasingly more important production factor in all industries (‘computerisation’). It was only when the computer industry's productivity growth slowed down in the 2000s that the negative effect of automation on aggregate productivity growth became apparent (Figure 2). While productivity growth is still higher in computer hardware and software than in all other industries, there was a noticeable slowdown since the 2000s, and more so in recent years. This generated the misconception that the aggregate productivity slowdown has its roots in the 2000s, even though it had already been underway in the preceding decades. Since Autor and Dorn (2013), the routinisation hypothesis has been put forth as a reliable predictor for automation – it is those jobs that are routine in nature that were first replaced by better machines and technology. However, it is important to differentiate ‘routinisation’ from computerisation – jobs that are easy to automate are different from jobs which use more computer-related technology. 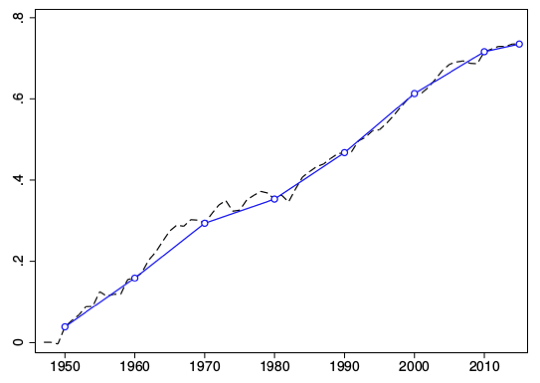 In Figure 3, we order occupations by their mean wage in 1980, and plot a measure of routinisation used in Autor and Dorn (2013) in blue. That paper showed that lower-middle wage occupations tend to be routine, and that it is exactly those occupations which seem to have been replaced by new technology. 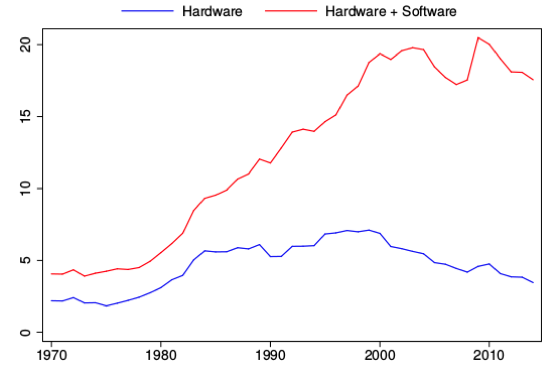 In contrast, higher-wage occupations tend to use both more computer hardware and software (red and black, respectively). Thus, automation may have hurt middle-wage workers, but computerisation made higher-wage workers more productive. Source: IPUMS Census, BEA NIPA and O*NET. How do the two relate to aggregate productivity growth? In our analysis, the driving force of the aggregate productivity slowdown is the differences in the speed at which different occupations and industries become routinised/automated. 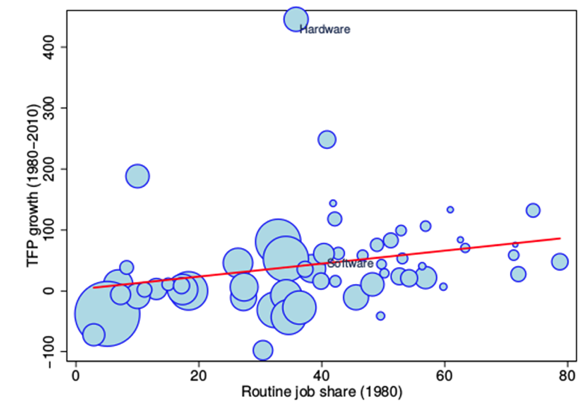 Figure 4(a) shows that industries with a higher share of routine jobs in 1980 saw higher productivity growth, indicating that those are the industries in which more jobs became automated over time. Then depending on the substitutability across jobs, workers and traditional forms of capital would have either reallocated toward or away from those jobs that experienced faster productivity growth. 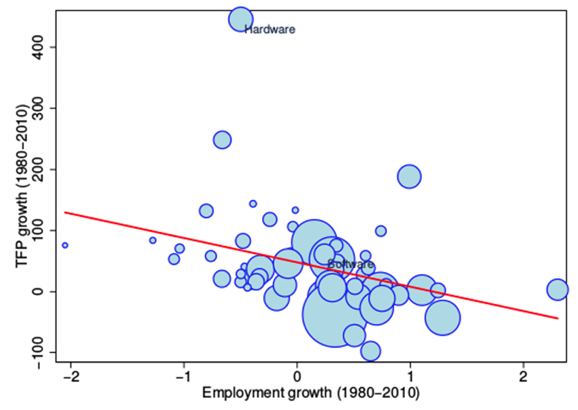 The data support the latter – high productivity growth industries shrunk in employment, as shown in Figure 4(b). As high productivity growth jobs shrank in value-added and employment shares, they began to account for less of aggregate productivity, and low productivity growth jobs for more. This compositional shift led to a slowdown in aggregate productivity growth. Source: IPUMS Census and BEA Industry Accounts. This is related to ‘Baumol's disease’ – that is, that aggregate productivity growth can slow down because sectors with high productivity growth may decline in importance (e.g. manufacturing). However, our results show that it is the shrinkage of high-growth occupations (and not high-growth industries) that accounts for most of the downward trend in aggregate productivity growth. The former can almost fully account for the slowdown, while the latter has only negligible impact. This implies that automation happens more at the occupation level than at the industry level. But notice that despite incredibly high productivity growth, the computer industry, especially the hardware industry, does not have a particularly high share of routine jobs, nor did its employment shrink much. To capture this fact, we build a model in which computers are used as a distinct type of capital input in the production of all industries (including itself). 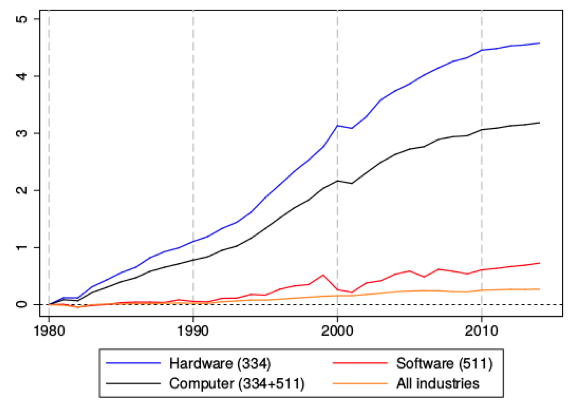 The prolonged period of the computer industry’s spectacular productivity growth was accompanied by a dramatic fall in the price of computer hardware and software, boosting the demand for computers in both production and more so in investment (Figure 5). 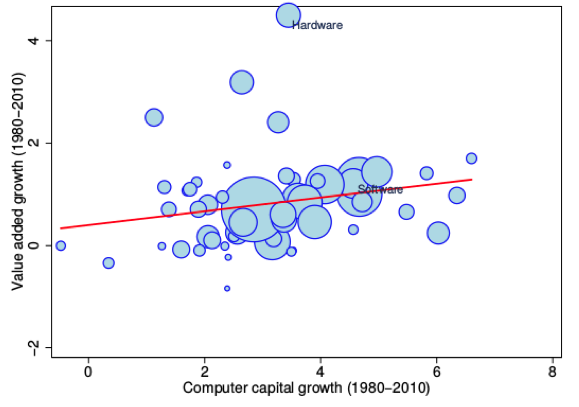 In fact, industries that relied more on computers grew faster (Figure 6), preventing the computer industry from shrinking. Thus, the phenomenal productivity growth continued to be reflected in aggregate output and productivity, more than offsetting the negative effect of automation (and complementarity across occupations in production) on aggregate productivity growth for almost two decades. Source: BEA Fixed Asset Tables (FAT). Source: BEA Industry Accounts and FAT Nonresidential Detailed Estimates by Industry and Type. So exactly how much did computerisation contribute to post-1980s growth? Using our model, we find that if there had been no growth in the computer industry, aggregate productivity would have grown by only 0.5% per year from 1980 to 2010, compared to its actual rate of 0.8%. The magnitude is surprising considering the fact that the computer industry’s share of aggregate output is only about 3-4% throughout the observation period. 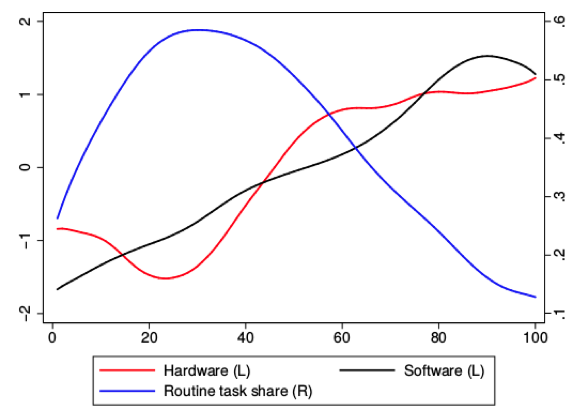 The large role it plays comes from investment – over this period, computers grew from about 5 to 20% of total investment (Figure 5). In fact, if productivity growth in the computer sector had been completely absent, aggregate productivity growth would have declined monotonically since 1980 – the slowdown of the 1970s may have continued without interruption (Figure 1). So the sluggish growth of aggregate productivity and output in the 2000s was not abnormal – it was the faster-than-trend growth during the 1980s and 1990s driven by the outburst of the computer industry’s productivity that was extraordinary. In our model, industries that increase their computer usage do so by substituting away from labour. Thus, even as high-wage workers use more computers, this is done at the expense of hiring less low-wage workers. Overall, we find that this substitution is large enough to almost fully account for the decline in the labour income share (workers’ employment and wages) since the 1980s (Karabarbounis and Neiman 2014), as shown in Figure 7. This is despite computers comprising only a tiny fraction (around 3%) of the total capital stock. Data Source: BEA NIPA and Industry Accounts. What does this all mean going forward? While the productivity slowdown will most likely continue in the near future, in the longer horizon we suspect that the boom of a new technology that spreads throughout the economy may play the role of an aggregate productivity booster as the rise of computers did in the past. This is speculative at best, but bio-tech, nano-tech, robotics, and artificial intelligence could all be the ‘next big thing’. But since this may worsen inequality between the owners and users of such technologies and the workers who are replaced by them, we need to vigilantly keep an eye on which types of skills to invest in for future generations, while also preparing to insure those workers who may fall through the cracks. Autor, D and D Dorn (2013), “The growth of low-skill service jobs and the polarization of the US labor market”, American Economic Review. 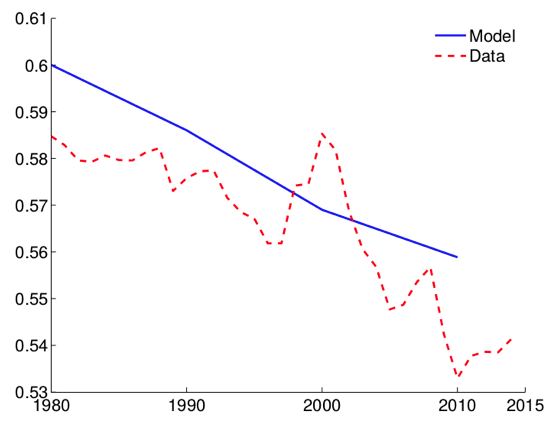 Karabarbounis, L and B Neiman (2014), “The global decline of the labor share”, Quarterly Journal of Economics. Aum, S, S Y Lee and Y Shin (2018), “Computerizing industries and routinizing jobs: Explaining trends in aggregate productivity”, Journal of Monetary Economics. Piketty, T (2014), Capital in the 21st century, A Goldmanner (trans), Harvard University Press. Teulings, C and R Baldwin (eds) (2014), Secular Stagnation: Facts, Causes and Cures , CEPR Press.